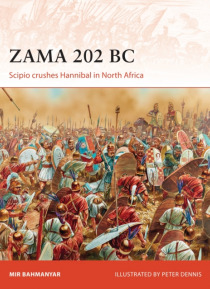 The battle of Zama, fought across North Africa around 202 BC, was the final large-scale clash of arms between the world's two greatest western powers of the time Carthage and Rome. The engagement ended the Second Punic War, waged from 218 until 201 BC. The armies were led by two of the most famous commanders of all time the legendary Carthaginian general Hannibal, renowned for crossing the Alp… s with his army into Italy, and the Roman general Publius Cornelius Scipio, who along with his father was among the defeated at the battle of Cannae in 216 BC.Drawing upon years of research, author Mir Bahmanyar gives a detailed account of this closing battle, analysing the tactics employed by each general and the forces they had at their disposal. Stunning, specially commissioned artwork brings to life the epic clash that saw Hannibal defeated and Rome claim its spot as the principal Mediterranean power.